Volunteering at Feed My Starving Children is a great team-building experience for groups of all kinds! Enjoy working together to save lives and feed kids in a positive, energetic and team-focused environment. It’s easy to make FMSC an integral part of your service programs. 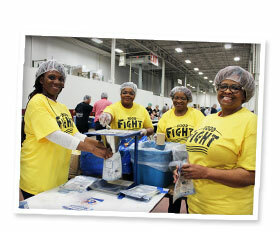 Your elementary, middle school and high school can participate and volunteer at FMSC together! Strengthen curriculum efforts that focus on all aspects of character development. Give students a real-world application of what they learn every day in the classroom. Students are able to work together for a specific period of time to experience a highly valuable and impactful outcome. At the end of every volunteer session the group knows exactly how many meals were produced to feed hungry kids around the world. 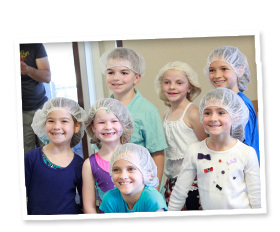 FMSC provides a deeply meaningful service opportunity for Sunday school and confirmation classes, mission programs and groups of all ages and sizes. FMSC volunteers are able to engage their hearts, hands and minds for Christ and feel fulfilled knowing they made a tangible difference, today. Many churches support FMSC by volunteering and fundraising regularly, while some link FMSC to their other mission activities by designating meals they pack for a specific country or mission program, or by delivering FMSC meals during mission trips to places their church supports. The FMSC approach offers a powerful opportunity to share the love of Christ and to see first-hand the difference FMSC volunteers make in response to Christ’s call to feed His starving children. 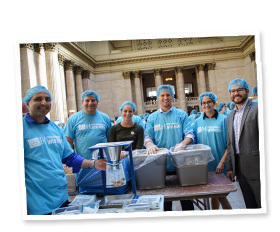 Corporations of every kind use FMSC as a site for team building programs. Because FMSC is an easy way to get small groups involved and accomplish something tangible together, the volunteer experience offers a wonderful opportunity for companies and organizations of all kinds to engage their employees and motivate them with the selfless benefit of feeding the world’s starving children.